I started lifting in 2012 for general health and fitness. I was very overweight at the time, around 265 lbs, and decided it was time to focus on my health while I was still young and before my weight caused any health problems. I started dieting and exercising and got down to around 200 lbs. During that time I heard a bit about bodybuilding through some friends I had made at the gym, and some lifting tip videos on YouTube. Looking muscular seemed like a good “next goal” for me and I started working seriously towards that goal. 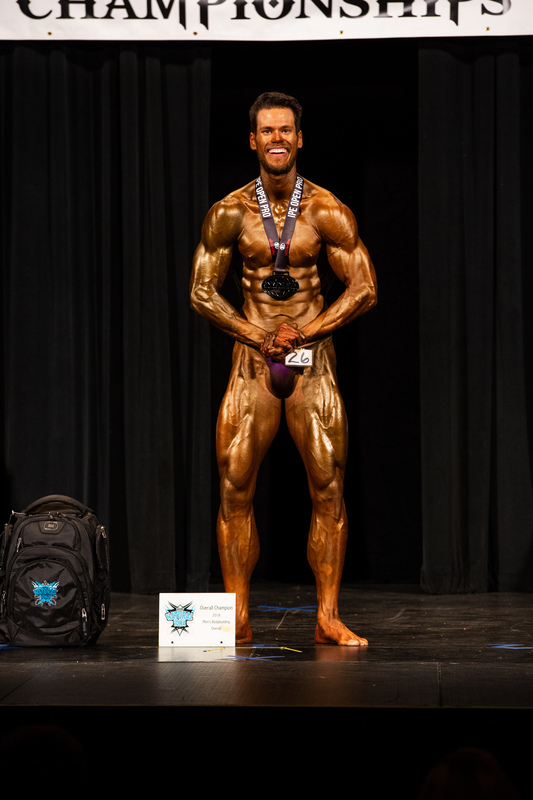 In 2015 I competed for the first time and absolutely loved the whole experience. Of course prep is difficult, but going through the entire process really shows all the work you’ve been putting in over the years. I also love that there’s no way to “hide” during prep – if you work hard it shows, and if you slack and cut corners it ALSO shows. Judges don’t care how hard you tried, they only see what you’ve brought to the stage. Prep is such an honest representation of everything you’re putting in! My 2015 season went pretty well and left me hungry for more so my coach and I worked hard for 2 years, started prep in late 2017, and had a 35 week prep into NANBF Natural Iowa! The second prep was honestly very smooth and much less taxing than the first go-round. Because we took the slow and steady approach, I was able to keep my macronutrients a good bit higher and do less cardio overall. The biggest obstacle was just making sure to stay focused for 35 weeks. 35 weeks is a really long time to hit all of your macros perfectly, and you also end up having to miss a lot of events. It can be hard going to family gatherings, birthdays, and holidays with a tupperware full of chicken and green beans but in the end your family will understand that you’re working towards a big goal. There’s always time for dessert or a big meal once prep is done! To me, the best thing about competing is being able to show myself and others just what it is that I’ve been working so hard for. Being lean looks nice enough while you’re lifting, but on stage with tan on you achieve a totally new level of conditioning and muscularity. Also, the audience cheering and energy of being on a stage is so exciting and gives you a feeling that can’t be replicated anywhere else. Being an IPE drug-free pro is incredibly meaningful to me. I’m especially proud of the results all drug-free bodybuilders are able to achieve from sheer focus and willpower. We don’t have anything to give us free results, or a helping hand. Every tiny bit of muscle – every striation – has to be earned through sweat and tears, and I love that. Your results are a direct representation of the work you’ve put in. Overall the thing I hope others can take away from my experience is that it doesn’t matter where you start, it matters that you continuously work hard without giving up. Through focus, self-control, hard work, and being honest to yourself about whether or not you’re putting in your max effort (or if you’re cutting corners) you can achieve the goals you set for yourself.